Reflecting on a career in which she spent years covering Barack and Michelle Obama and subsequently helped ignite the #MeToo movement, journalist Jodi Kantor is every bit as proud of a story she wrote that garnered little attention when it was first published in 2006. Seven years later, Kantor received an email from a woman who had been moved by the story when it first came out and since that time had been working diligently to address the issue. She helped develop a free-standing lactation station for breast feeding and pumping, and was installing a prototype in the Burlington, Vermont, airport. Today, “those little lactation stations are spread across the country, over 400 of them at last count,” Kantor explained. “They’re giving women, especially hourly workers, privacy and dignity and a way to care for their babies. Kantor brought that message to campus during a public lecture in the Hollins Theatre on November 14. 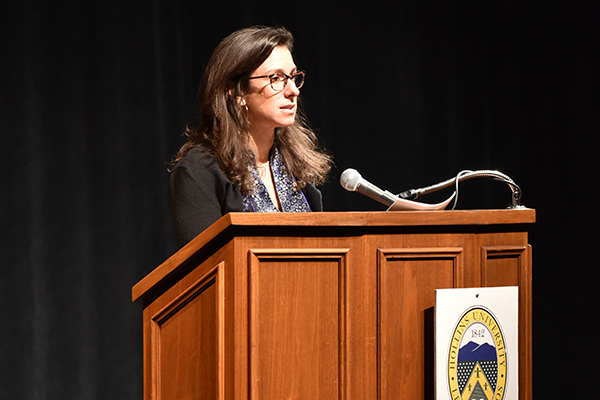 “An Evening with Jodi Kantor” was sponsored by the university’s Distinguished Speakers Fund, featuring the Pulitzer Prize-winning investigative reporter and bestselling author who helped expose Hollywood producer Harvey Weinstein’s decades of sexual abuse allegations. Kantor and fellow reporter Megan Twohey broke the Weinstein story in October 2017 in The New York Times, and their work has played a significant role in shifting attitudes and spurring new laws, policies, and standards of accountability around the globe. As it turned out, the Weinstein story had significant repercussions that persist more than a year after its publication. “It hasn’t stopped in New York, or Hollywood, or India, or here in Virginia,” Kantor said. “It’s been ricocheting in offices across the land and on campuses like this one. It has rewritten some of our personal and most intimate histories. What we’ve learned is that harassment and assault are not actually individual experiences, although it can certainly feel that way. The most powerful thing that you can see now is that it was a collective, shared experience. We know now that nobody who experiences it is truly alone.